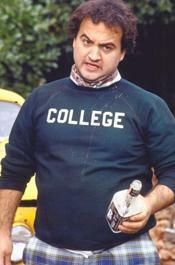 APRIL 7--In a terrible miscalculation, a Louisiana State University fraternity entrusted four underage members to transport its massive beer and booze cache from Baton Rouge to sunny Gulf Shores, Alabama, where the collegians this week are celebrating spring break. 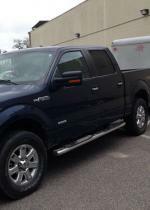 Sadly, however, the quartet of teenagers got to within 50 miles of their intended destination when their Ford F-150 was pulled over yesterday on Interstate 10 by eagle-eyed deputies with the Mobile County Sheriff’s Office. 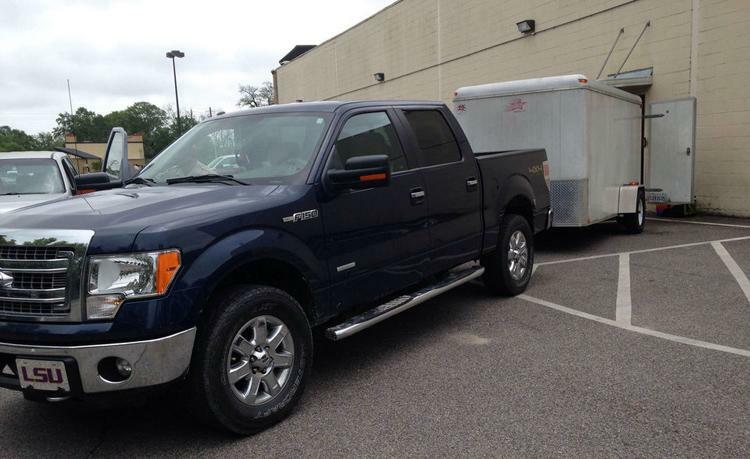 The lawmen noticed that the pickup was towing a trailer with expired plates. During questioning, the frat brothers consented to a search of the trailer, which was packed with adult beverages intended to be enjoyed by the Phi Kappa Psi members and their cronies. 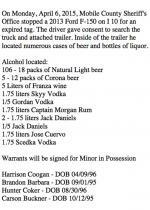 Since the truck’s occupants were all minors, deputies seized the alcohol: 106 cases of Natural Light beer; five 12-packs of Corona beer; five liters of Franzia boxed wine; and liter-sized bottles of tequila, rum, vodka, and Jack Daniel's whiskey. 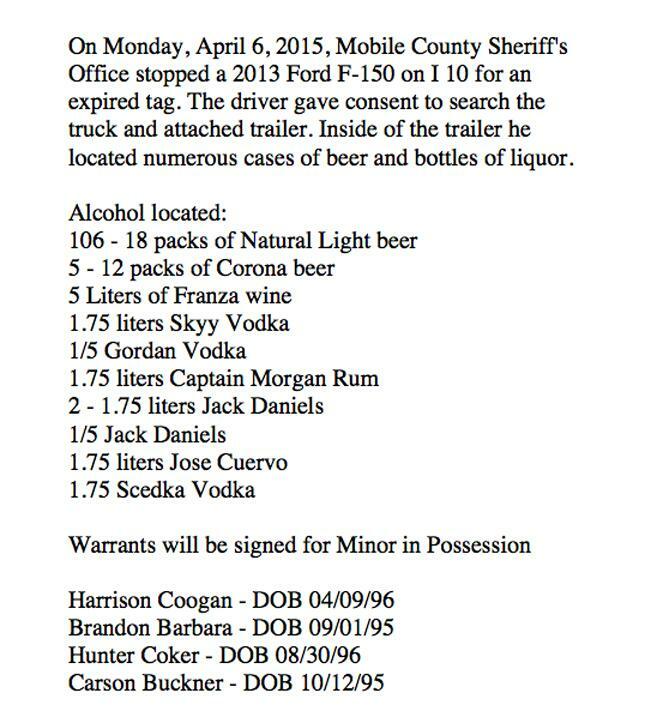 Investigators cited Hunter Coker, 18; Harrison Coogan, 18; Brandon Barbara, 19; and Carson Buckner, 19, for being minors in possession of alcohol. Each of the students joined Phi Kappa Psi in late-2014. 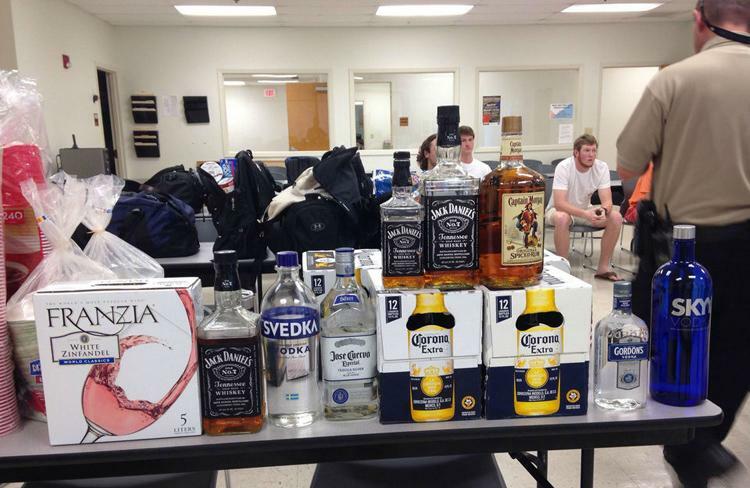 Deputies made sure to photograph the truck and the prodigious booze haul (and captured the chastened frat brothers in the background of the shots). The seized alcohol will be destroyed, according to a sheriff’s spokesperson. 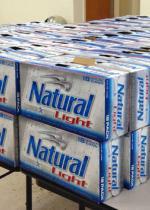 Two days before the booze bust, Coker posted a photo (seen below) to his Instagram page showing him and four other young men posing with scores of cases of Natty Light piled in a truck bed. 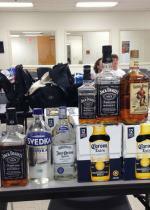 “I think we have enough for spring break,” Coker (the gent in yellow) captioned the image.